The Martingale system remains to be one of the most popular roulette betting systems today. Even with too high risks required this system attract more and more players. Being a negative progression system, this strategy requires some budget to be spent… of course in case you lose. But anyway it promises you to win at least 1 bet ahead. Let’s check whether it is true or not. Everything is simple. You should double your bet every time you lose. Yeah, exactly. Only when you lose. For example, you stake $5. If you lose, the next bet should be $10. If lose again place a bet equal to $20. Then $40, $80, $160, etc. As you can see you should have quite decent budget to play on long loss. The very moment you win, you should return to your first bet. In our case it is $5. Thus, you will always win one bet. And it doesn’t matter how much you lose. If you stick to this system you definitely get everything back… and even some profit. You have some system to follow. It allows you not to think. At all. And be sure that you will win. However, the Martingale system can be good for high rollers only. Moreover, you are asked to risk your money within 50 rounds or so to get one chip win only. That’s sounds not fair. And not so tempting as it seems. 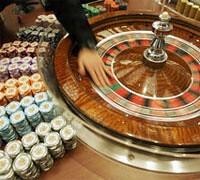 You also should check the table limits choosing some or another roulette game. Sometimes it can be a crucial factor if you decide to imply the Martingale system. Just imagine that you lose and lose again and need to increase your bets constantly. The large sum is reached and spent… but you have no chances to get it back because the roulette game you played have limits. For example, $2,500 or so. Just imagine what sum you can lose. Well, it scares a little bit. However, to believe in such a road of constant loss is not a good idea. You should win anyway. On the whole, your win won’t be so great as the money you should prepare for it. In theory, the Martingale system is unbeatable. In reality you have two factors on your way to wealth. Your total bankroll and the roulette table limits. Well, if you prepare a nice bunch of bucks and find the best live roulette game ever – this system can bring you some profit. What is more, you also can check Anti-Martingale system. What does it mean? You just increase your bet after any winning. Well, sounds strange. In other words, you leave your bet and add your winning. This time you should set the number of spins you are going to play. Just because you can’t win all the time. Such system also reminds the Labouchere system. To learn more about it as well as other roulette betting strategies to win, you can browse our site.